Oscar Brownless was amongst the Cats’ best, showing off his skillset in a tough match. Geelong’s VFL side has suffered a heavy defeat in their first practice match of 2019, falling to Essendon, 4.10 (34) to 13.11 (89) in Thursday’s clash. The Cats were slow to get into the game and remained out of the contest for most of the day. In contrast, the Bombers came out firing, kicking four early goals to open up a 27-point lead at quarter time. The scoreboard remained lopsided for much of the first half with the Cats unable to trouble the scorers until late in the second term. The home side lifted their intensity in the second half but never got within four goals of the Bombers. With the Cats showing signs of fatigue in the final term, the visitors continued to increase their lead before running out 55-point victors. The loss was not the ideal way to start the preseason campaign, but it will hopefully prove to be a learning experience for the young Geelong side. It was the first time that the Cats’ AFL and VFL listed players competed together in a competitive match this season. While the chemistry of the side still has a long way to go, the next three weeks of practice matches will give that chemistry a chance to develop. Despite the disappointing result, there were numerous positives for the Cats in Thursday’s clash. Jamaine Jones showed promise in a new role across half-back, performing admirably in the face of a plethora of Essendon forward entries. A host of new draftees also took the field for the first time, giving Cats fans a glimpse of the club’s future stars. Nathan Kreuger was among the goalkickers while Ben Jarvis provided a strong target up forward. Recently appointed VFL captain James Tsitas was among the major ball winners on the ground, as was defender Campbell Floyd. 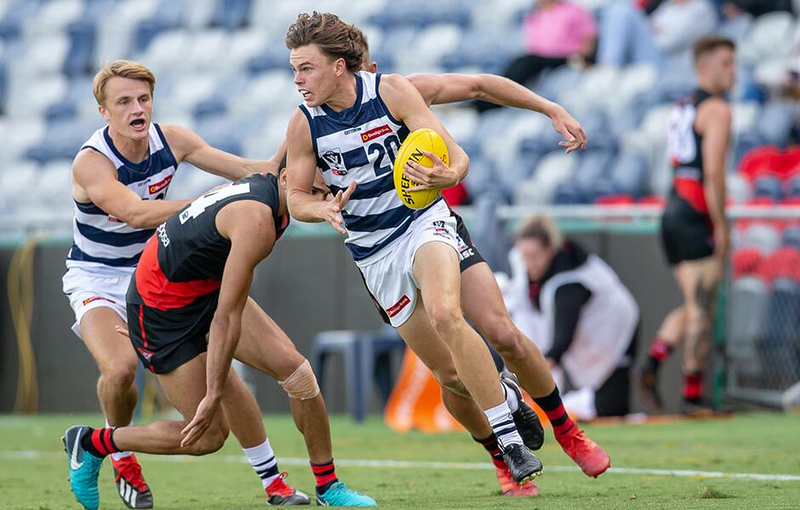 The VFL Cats will look to improve next Friday night when they take on Werribee at Avalon Airport Oval. Injuries: Nil @ GMHBA Stadium.